the Heck Is a Timberdoodle?? HELPFUL INFO ABOUT MY BREED!!! 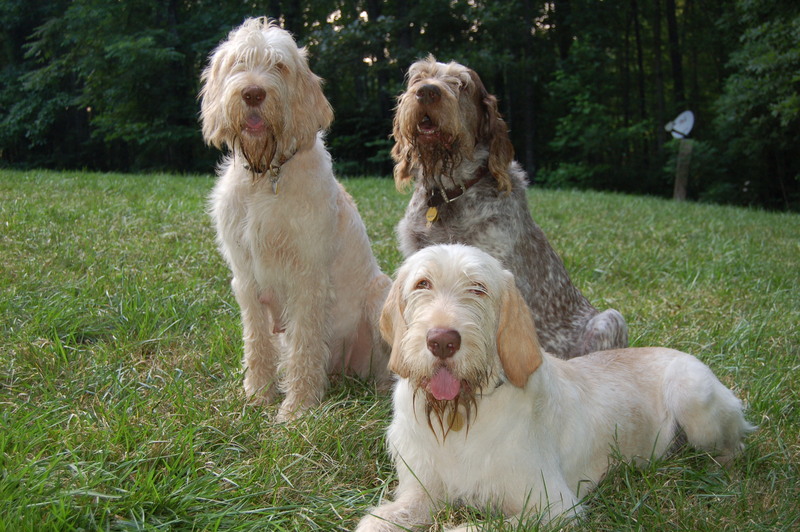 The Spinone, also known as the Spinone Italiano, Spinone or Italian Griffon (Spinone is preferred as the breed is unique and indivisible) is an ancient breed dating back to as early as 500 B.C. In Italian, Spinone roughly translates as "very prickly" referring possibly to the wiry coat or the breed’s ability to hunt and bust through thickets in search of game. During World War II, the breed was almost lost but save for the efforts of enthusiasts in Italy who reconstructed and brought the breed back from the edge of extinction. A popular gun dog in Europe, the Spinone is a relative new comer to the United States. Attempts to establish the breed in the mid 20th century resulted in failure. During the early 1980’s another more successful importation of the breed was accomplished and this wonderful dog is now firmly entrenched in the U.S. having become AKC recognized in 2000. The Spinone is a dog of rugged, solid construction being powerfully built with well developed muscular proportions and rough wiry coat which is useful for brush busting as well as water work. The eyes are described as "human like" and give the Spinone a startlingly intelligent look. An intelligent breed, easy to train and eager to please. The face is framed in longer hair that forms arched eyebrow, moustache and beard giving a "gentlemanly" look. Spinone come in brown roan with brown patches, orange roan with orange patches, white with brown and solid white. Grooming is made easy by the occasional stripping of hair from the body. The Spinone is a happy and enthusiastic breed. Very easy going he is always eager to please his people. Some would say you don’t own a Spinone, they own you! Spinone do require inclusion to the family and thrive on being with their people. A very low key breed not prone to barking unless a stranger shows up, nonetheless, exercise and room to run is essential to their health and well being. Spinone have a personality that is clownish and a vocalization that is unmatched in its uniqueness. A series of low, guttural growls, ooh-ohhs and other indescribable sounds mark this breeds ability to communicate. Friendly to all the Spinone especially loves children and will play for hours on end. Like any animal, the Spinone needs to be treated with respect and love. Abuse will be remembered by the Spinone. From a hunting perspective, the Spinone is a versatile hunter utilized in both upland and waterfowl hunting. At home in the field as well as a powerful swimmer, the breed is an excellent pointer/retriever. Do not expect a Spinone to hunt in a fast flashy manner as some field breeds do. The Spinone is slower and methodical, working a field with great seriousness, detail and concentration. This can be misconstrued as a lack of ability due to the slower and sometimes seemingly non-chalant pace, but once hunted over, you will find the Spinone can rarely be matched for game finding ability and dedication to the hunt. • Size: males run between 60-85 pounds with females 55-70 pounds. • Energy: Though relatively laid back and considered a couch potato at times, Spinone still require a large area to run and play. Hunting or field trialing is highly recommended to maintain the vigor and desire of the breed to hunt; he is bred to hunt and some type of field work is essential. • Attention: Spinone are constantly looking for your attention. If you don’t have the time or energy to devote to your buddy, then this breed is not for you. They require human interaction to maintain their health and vigor. • Scarcity: Due to being relatively new (mid 1980's) to the U.S, finding a Spinone pup can be a challenge. • Intelligence: They are exceptional in their ability to open things they shouldn’t; refrigerators, doors, cupboards, etc. Their innate curiosity can cause problems at times. • Slime: Famous for their "Spinone Slime". Particularly after drinking, a slime towel kept handy is a normal part of a Spinone owners décor!! 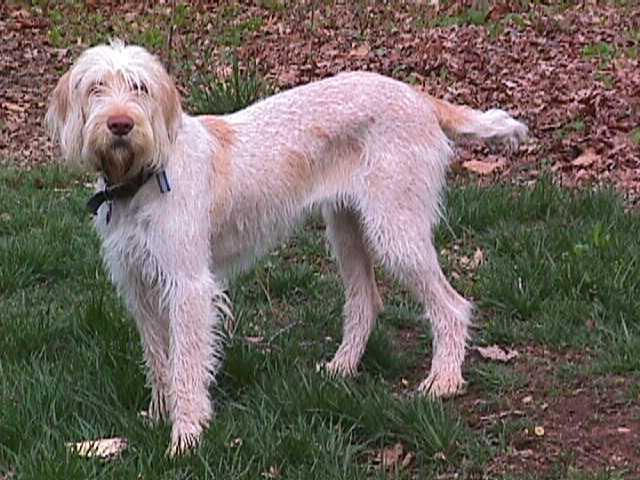 The Spinoni Italiano, also known as the Spinone, Italian Spinone, or Italian Griffon is a large, rugged dog of distinctive appearance. He has a long head, with hanging ears and eyes described as "human like." In body he is a substantial, strong boned dog of square build. This deep-chested breed has a topline that slopes slightly up from below the withers to the muscular hindquarters. Everything about this breed indicates great strength as well as stamina. Suited for hunting in all climates and on all terrain. Its coat in fact protects it from the water and freezing temperatures of the swamp. It goes nonchalantly into cold, deep water, being an excellent swimmer and a model retriever. Although not common in the U.S., this breed has a long history of service to man. His rather uncertain heritage centers around Europe and it's gun dogs of long ago. Whether he was the basis for bringing forth other gun breeds, or whether they simply sprang from common stock is not known. Like all Italian breeds it is ancient. In Renaissance Italy a pointer with wiry hair was already present and reached us with much difficulty, due to extraneous crossbreedings performed heedlessly. After 1950 the breed was reconstructed by a few great breeders. Its innate merits are its sense of smell, setting, retrieving, recovering, and the close ties it has with the hunter. The breed has excelled as a pointer and retriever for centuries. Today he is still a popular hunting dog in other countries, as well as pet. The United States seem to be at last discovering this versatile dog. The Spinone's grumpy appearance contrasts with its gentle and affectionate disposition. It has a great capacity for learning and the desire to satisfy its master most completely. Very sociable, courageous, loyal and an excellent companion. Today the breed is popular not only in Italy but is also raised in England and Scandinavia. The Spinone has a marked tendency to trot broadly and swiftly. Below is a brief discription of the Conformation/ Apperarance of the Spinone. 61 lbs. to 85 lbs. Wire-haired, thick, slightly wavy coat, 4-6 cm long along its body, longer on the eyebrow arches, lips and chin where it forms mustache and beard which give it that typical gruff and kindly look. White; white with orange; orange roan; orange roan with orange patches; white with brown; brown roan; brown roan with brown patches. The preferred shade of brown is the color referred to as "Capuchin Friar’s Frock". Not permitted colors are: tricolor, tan markings, black under any shape and combinations. This breed requires just a small amount of stripping, pulling dead hair as opposed to cutting, to neaten the coat. Other than that, just a weekly brushing will suffice. Bathe as necessary. Some say this breed grooms himself like a cat. As a youngster, the Spinoni displays a restless nature typical of the hunting breeds. There is nevertheless an underlying calm to this breed that is obvious to all who meet him. This is a lovable, sweet, affectionate puppy who quickly becomes devoted to his family. Said to have a natural caution with strangers. the Spinoni should be well socialized to prevent shyness. Those who have lived with this breed agree that he seems remarkably "tuned in" to his owner. Even in the field, the Spinoni's style is to work close to the hunter. He trusts his family implicitly, but once betrayed will never forget it. Very gentle training should begin early on, as he can occasionally be a bit obstinate. He is not one to challenge for pack position, and he is playful in all categories. Not surprisingly he is most restless at this stage of growth, while his hormones sort themselves out. Still very loving and affectionate, he needs a great deal of attention from his family. This is not a breed to amuse himself, he needs interaction with those around him. When well socialized, he is generally cautious but friendly with strangers, taking a moment or two to size them up. Most are not aggressive with other dogs, though owners should always be alert when introductions are made. He remains playful in all categories. As an adult, this breed puts his restless stage behind him, maturing into a fine companion, calm and very gentle. He can also be sensitive. His somewhat independent nature is offset by his kind, agreeable attitude toward the world. Centuries of serving and living closely with man has produced a breed that is docile yet vigorous, non-aggressive yet courageous, and friendly yet vigilant. He remains fairly playful all his life. As one breeder put it, "Always a puppy!" This noble dog is a credit to his heritage. Happy, upbeat and enthusiastic, the Spinoni Italiano is a pleasant, easy-going breed. He is easily satisfied when treated as a member of the family. Although serious when at work in the field, he definitely has a clownish side that is often quite entertaining. Never bossy or whiny (unless constantly ignored), this gentle soul loves children, those he knows and those he does not. Children must be taught to treat this wonderful dog with the love and respect he deserves. His great patience should never be taken for granted--abuse is abuse, whether intentional or not. This breed gets along well with other animals, particularly enjoying the company of another dog. He wants to be with his people, whether that means at home or traveling, preferably in someone's lap! No, a quiet breed in general. May occasionally howl along with a siren. Content within a fenced yard, this large dog is nevertheless capable of jumping very high. The occasional one is a tunneler. Talk to breeders about secure fencing. Not a protection breed, he is either unlikely to attack under any circumstance or would only do so if he or his family is directly threatened. A good breed to jog with, the Spinoni Italiano is not a "racy" type dog, moving more slowly and methodically than many other gun dog breeds. As such, he can do well with a small yard combined with frequent walks and play. Does occur, though not a huge problem. Cerebellar Ataxia a Genetic Disease identified in the Spinoni Italiani. This particular Cerebellar Ataxia is inherited as an autosomal recessive gene. This means that a puppy must have inherited a copy of the abnormal gene from both the sire and the dam for the puppy to display the disease. It means that both parents carried the gene, but did not suffer from the disease. A litter from a mating of two carriers will produce on average 25% puppies who will die of the disease, 50% who are well but are carriers and if mated will pass on the gene to 50% of their offspring, and 25% totally normal pups. GO TO THE HEALTH PAGE FOR MORE INFORMATION ON Cerebellar Ataxia. He learns fast, but is sometimes a bit stubborn about performing. The Spinoni has a mind of his own, feeling there should be a good reason for doing the task asked of him. For example, one breeder mentioned that his dog is perfectly willing to pick up downed birds, but he is reluctant to retrieve a training dummy. Nor does the breed perform in flashy style, instead being a slow, steady worker on the hunt or in the ring. Sadly, many judges penalize this, expecting all dogs to work like a pointer (field) or a Border Collie (ring). Motivational training is the only way to go with this sensitive breed. Very high: obedience; lure coursing (not eligible); tracking; agility; search and rescue; hunting; backpacking; therapy dog; assistance dog; retrieving; carting; flyball; watchdog. Others are quite possible, though not as likely. In spite of how wonderful this breed sounds, he is still not for everyone. For many active people, he would be too laid-back. For true couch potatoes, he needs too much exercise. For someone looking for a high in trial obedience dog, he lacks the flash. Some people would prefer a dog who is less needing of attention. Still, this breed does suit a great number of prospective owners. I have no doubt his popularity in this country will rise, hopefully slowly. The Spinoni may be a bit difficult to find, requiring interested parties to go on a waiting list. If this is truly the breed for you, it is worth the wait. The Spinone can be timid if not properly socialized. The "FEAR" impressionble stage is from 4 to 10 months of age. Be cautious about purchasing, or shipping a puppy at this age. It is recommended that you pick up your puppy personally if purchased during the "FEAR" impressionable stage rather than having the puppy shipped to you. In addition, if the puppy is kennel raised, he/she will be extremely fearful of "house noises" and probably not be "potty" trained. Be sure to ask if the puppy was house raised versus kennel raised. It is also imperative to ask the breeder for the OFA (Orthopedic Foundation of America) or PENN HIP certification for the status of possible Hip Dysplasia of the Puppy's sire and dam, rather than merely a "reassurance" that the they have been x-rayed. For example, the English Breeders require that the animals be x-rayed, but they are not required to pass any particular standard. Where are you located? 25 miles southwest of Richmond, Va.
Do you ship puppies? No. But, you can take them as carry-on on most major airlines. Are there any temperment differences between males and females? There is a slightly more rascally temperment in the males, but, compared to most breeds, not a huge difference. Do they shed? We have 5 Spinoni so it's hard for us to judge; but, for the most part really not that bad. How do you groom them? Mostly by light combing and hand stripping. We don't recommend taking them to a groomer as most groomers have never even seen a Spinone. Do they do well with children and other critters? Absolutely. They love kids and get along with most critters. Birds........ that can be an issue; hey, they are bird dogs!! I don't hunt; will they still be ok as a companion? Although our preference is to hunters, we realize not everyone bird hunts. With that said, they are excellent companions and family members. But, being a strong, instinctual hunting breed, they do require room to run and exercise their hunting instincts. Not an apartment breed. How active are they? Spinoni are bred for close hunting, so, in the field they tend to be low key and hunt close. In the home, they are famous for being couch potatos and love to hang with the family. 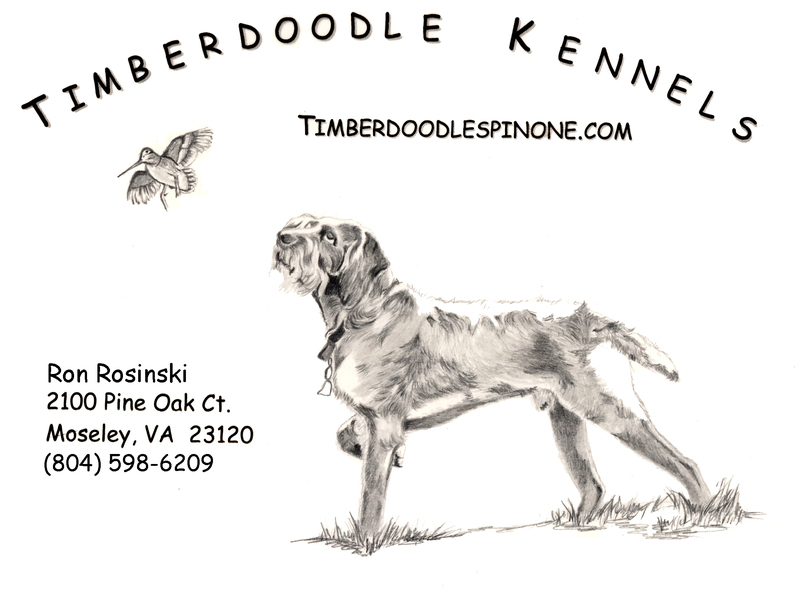 Copyright © 2018, Timberdoodle Kennels LLC. All rights reserved.